In a testament to good old-fashioned ingenuity, record numbers of American are engaging in entrepreneurship these days. A lot of folks tired of waiting around for an economic upturn have decided to create their own jobs. It’s called “necessity entrepreneurship,” and according to a study by the University of Missouri published last year, the percentage of American entrepreneurs in the “necessity” category nearly doubled from 2007 to 2010. 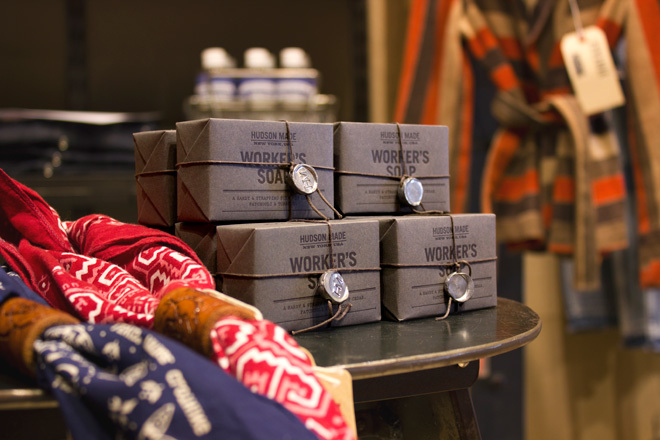 Hudson Made’s Worker’s Soap is among the select products featured in Levi’s “Made Here” collection, which spotlights American-produced and vintage goods. While the U.S. economy continues to struggle, a recent article in Time Magazine offers a glimmer of hope as it hails the comeback of “Made in America.” Outpacing other advanced nations, the United States has created 500,000 manufacturing jobs in the last three years. Additionally, big players like Apple, Dow Chemical, Airbus and even Wal-Mart have plans to open, fund or return factories stateside. The article goes on to suggest that the offshoring bubble may finally have burst. Either way you look at it, there is a cultural shift at hand. People are acknowledging that goods made in America—whether by restructuring corporate giants or small upstarts—are vital to the survival of our economy and way of life. 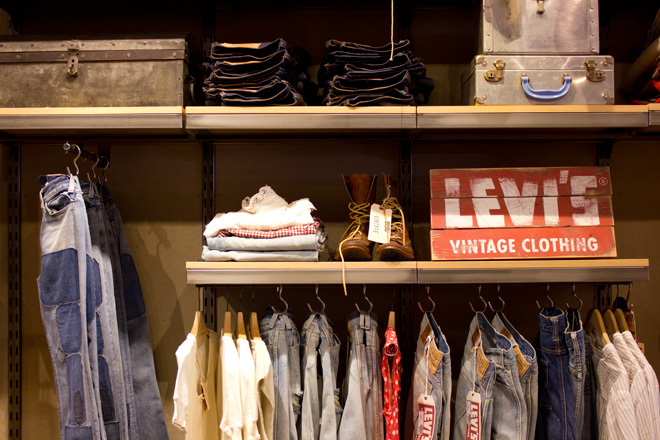 Levi Strauss and Co. is one of those iconic brands that came of age right at the dawn of America’s modern era. They even call their Original 501 Jean “the ultimate icon of American culture.” And it’s true. Who of us hasn’t owned a pair? Who of our grandfathers hasn’t owned a pair? But like many iconic American brands (Barbie, Radio Flyer, Chuck Taylors…), by the early years of the 21st century, all of Levi’s domestic factories had shuttered their doors as an industry trend saw the outsourcing of American manufacturing jobs to foreign competitors. Handmade cowboy boots from Marfa, TX. Flash forward to 2013, Levi’s Global Brand Concept Designer Jay Carroll is scouring the country for the finest hand-crafted, American-made goods to be sold alongside Levi’s premium clothing lines in experimental “neighborhood stores” that appeal to a collective nostalgia evoked by the brand itself. Carroll is curating the Made Here collection. Among others, it includes traditionally built cowboy boots by a couple from Marfa, TX; leather moccasins stitched by hand in Cave Junction, OR, and individually strung beach-stone necklaces from the shores of Stonington, ME. 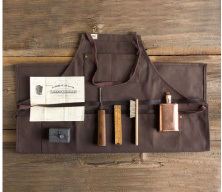 Each piece is wholly—beautifully—a product of its own birthplace. Not only are they sourced from local raw materials by artisans and craftsmen, but they also serve as a cultural and historic narrative of their individual regions of origin. Merchandising displays in the Levi’s store in New York’s Meatpacking District, one of the brand’s flagship locations that hosts its “Made Here” collection. 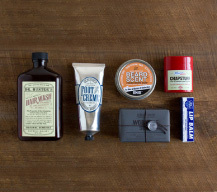 So it should come as no surprise that Levi’s came calling when Carroll discovered Hudson Made’s Worker’s Soap. The popular pumiced cleansing bar has struck a chord with countless bloggers and designers since it debuted last year. And now you can purchase it in any of Levi’s six neighborhood stores in Boston, San Francisco, Malibu, New York City and Shanghai. 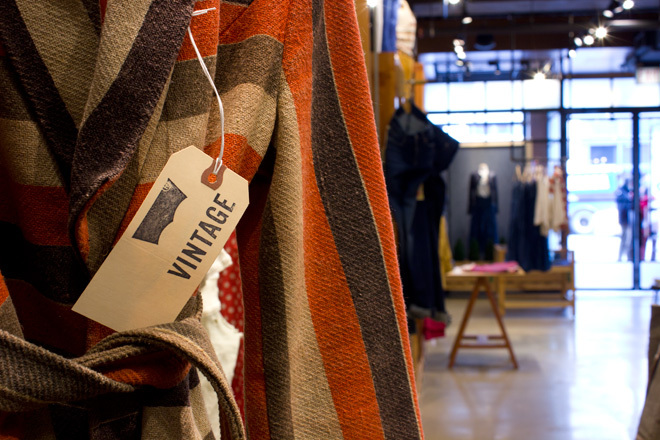 Beyond these new partnerships that feature the American artisan, The Levi Strauss Foundation has made a long-term commitment to low-income working people and asset building. Inspired by the American Dream Demonstration in 1997 (a pilot program that matched savings accounts for the working poor), the foundation has donated millions of dollars toward asset building in the U.S. and abroad. The initiative aims to help break the poverty cycle and ultimately make home ownership and entrepreneurial job creation a genuine possibility. For more information, visit: TheMadeInAmericaMovement.com. For a comprehensive list of American-made items (from luggage to vitamins to washing machines) and where to get them, visit AmericansWorking.com. 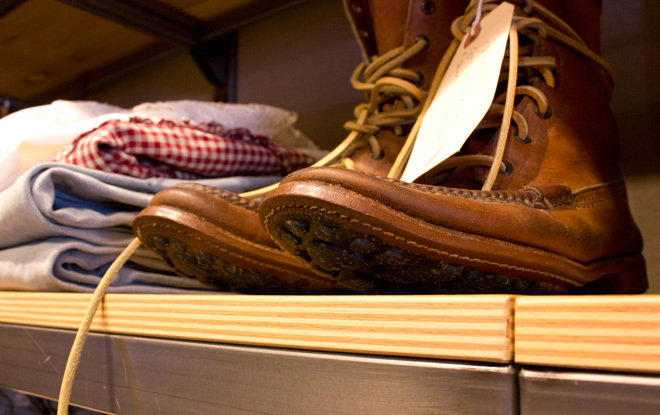 And for a stylish and rugged look at American-made fashion, visit TheAmericanStyle.net. 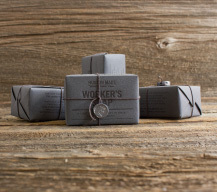 Check out our exclusive Hudson Made Worker’s Soap, and sets that pair it with one-of-a-kind items as well as some of our most popular grooming products.